All Swing components use Key Bindings, but what are they? Well, have you ever wondered how the “copy” functionality of a text component works? The KeyStroke (Ctrl+C) is used to invoke an Action (copy). So a key binding is simply the mapping of a KeyStroke to an Action. Swing uses an InputMap (well actually it uses three of them), to contain the KeyStrokes and an ActionMap to contain the Actions. 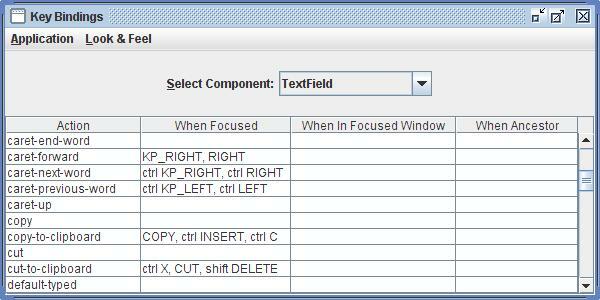 The InputMap and ActionMap are linked together so that when a key on the keyboard is invoked the action is performed. The Swing tutorial on “How to Use Key Bindings” gives a much better description of this process then I can provide here, so I suggest you read it for more detail, as it is important to understand the usage of the three different InputMaps. So, now that you know that key bindings exist, you are probably wondering what the default key bindings are for each component, right? Well, if you are curious, then the Key Bindings application is a good starting point to find this information. Remember that there are potentially 3 different InputMaps for any given component so you should use the UIManager Defaults program (link below) to determine the appropriate InputMap to update. You should only try to access these shared maps after an instance of the component has been created. This entry was posted on October 10, 2008 at 8:51 pm	and is filed under Application, Swing. You can follow any responses to this entry through the RSS 2.0 feed. You can skip to the end and leave a response. Pinging is currently not allowed. This is an awesome little program! I wish had it (or had the good sense of writing something like it myself…) years ago. Thanks. Writing the code helped me better understand how key binding worked and it sure beats looking at the code to find action names. Definitely. It is very useful (in fact, I’ve used it already at work). Hi. i want to put a different keystroke to a JButton. in my case ENTER because default inputmap is space. i am trying but no success. i want to add a actionperformed to a button and when it´s focus i can press enter and the action for button response. this is the code i am coding. thanks a lot. sorry by my poor english. Excellent post. I knew JTable supported copy out of the box, but I didn’t know why. Thanks to your post on Action Map Action, I can easily create a context menu option to copy out of the table as well. Thanks! Glad this posting was able to solve the mystery of built in support for certain functions. Actions are a great time saver. Tremendous! I’ve been beating my head against the wall with this stuff. This is wonderful, as I’ve said before, however, now Java 6 is past end of life and security settings won’t let me launch this. Yet I need to see the information that I know is here. Help! No biggy, I just got the source, compiled and ran it. But it might be worthwhile for you to update the page to not require an obsolete version of java. As far as I know it should run on any version of Java from 1.6 and above. I think the security message is the browser. I must admit I don’t really understand the security implications of using Web Start and what is necessary to fix the problem. I have been using JDK1.7.u10 for over a year with no problems (that I can remember). However yesterday I did upgrade to JDK1.7.60 and am now having problems. So, yes, I will try to look into this. All code can be freely downloaded as you did so it is not a big issue. I just though I would include the WebStart apps to demonstrate some of the features of the code without you needing to write you own little test app. Thanks for the feedback.